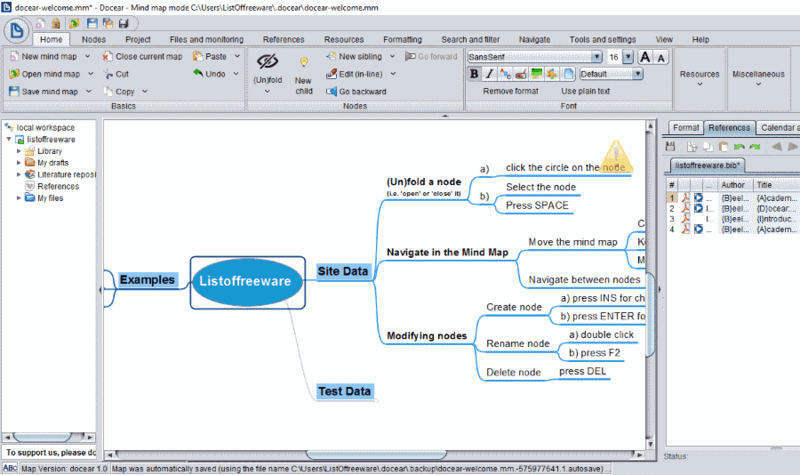 Here is a list of Best Free Mind Mapping Software For Windows. These software give you the freedom to write down your mind on a blank canvas in form of mindmaps. A mindmap can be very extensive and of different types. These Mindmap tools help you to lay down Ideas, Plans, Business proposals, and Projects in an interconnected way. You can also use these software as Brainstorming software and collect ideas. These software provide tools to put down ideas and connect them properly. These mindmap software offer mindmaps with or without encryption. An idea is put down by beginning with a Parent node. Add Child nodes and Sibling nodes to put down more ideas and contents on the mindmap. Some of these software provide shortcut keys to add nodes and perform other actions, making the task easy. 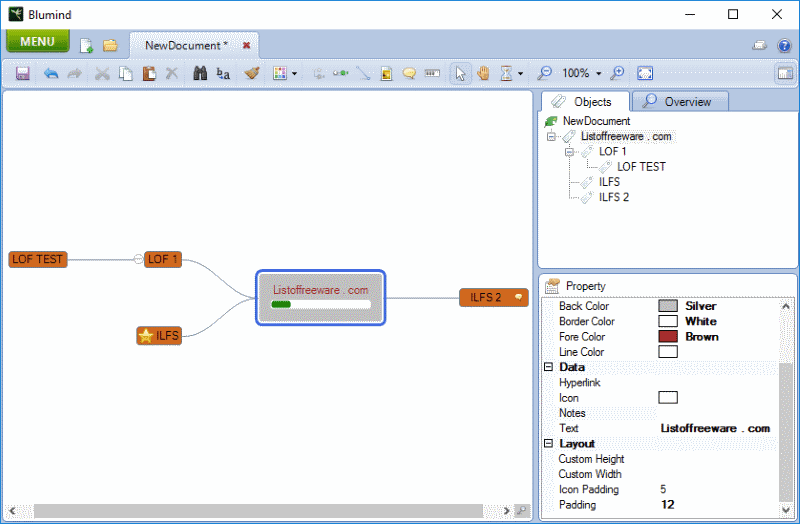 Nodes and Text styles can be customized in most of the mentioned mind mapping software. Node customization options let you change node color, node size, node opacity, and node style. Some of these software provide floating node option, node summary option, and much more. You can use your creativity and can create wonderful and informative mindmaps using the options that these tools provide. Make use of tags, emoticons, and clip arts to make attractive and visually informative mind maps. Options to add hyperlink and to add link to files stored locally on your computer, add photos, add notes, etc. are available in most of these mind mapping freeware, and help to make a mindmap more informative. Some of the tools are quite straightforward and do not feature many custom options. They only let you add nodes and connect the nodes and make simple mindmaps. Projects can be saved in these mindmap tools in their respective format. There is not any global format to save mindmaps; however, these software provide options to export mindmaps as images (PNG, JPEG, TIFF, GIF, and BMP), documents (DOC, XLS, and PPT), HTML, HTM, XML, CSV, SVG, etc. Go through the article to know more about them in detail, and pick the one that is best for you. You will also get to know how to make mindmaps using these software. I like FreeMind and Labyrinth the most. 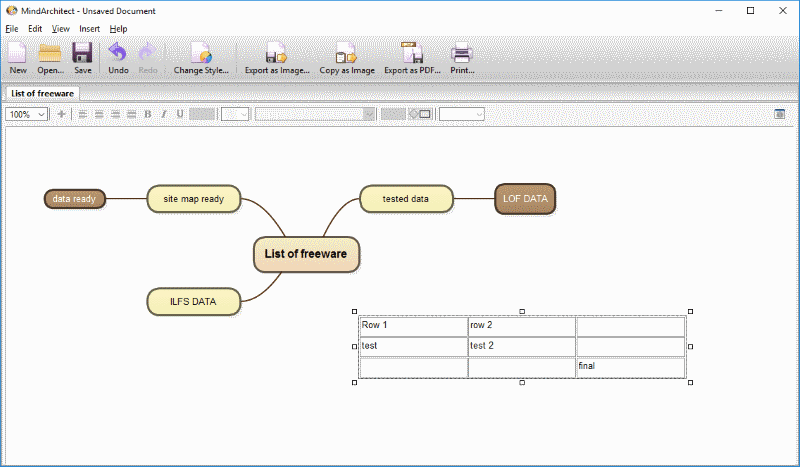 FreeMind provides a bunch of tools to make mindmaps without any limitation. Labyrinth is a simple mindmapper and would like to use it when visual appearance is not of importance. You can also checkout the list of best free Timeline Maker Software, GRIB File Viewer, and Project Management Software. FreeMind is an opensource mind mapping software with awesome capabilities to put whatever you have in your mind, onto a digital canvas. Though this software has been discontinued, you can easily download it from the internet. It is a cross platform mind mapping software and works on Windows, Mac, and Linux, as it is developed in Java. Create multiple mind maps in different tabs at a time using a wide array of tools and formatting options. If you have an idea, start working on it right away by putting it down in a creative way. Encrypted mind maps can be created here as well. To let you put down your ideas, start with a Parent Node, and start building ideas or expanding ideas by adding new Child nodes and Sibling nodes. For each Child node, you can add their Child nodes and Sibling nodes; this gives you freedom of limitless idea expansion and brainstorming with this free mind mapping tool. Encrypted nodes can also be inserted if you want. Click on a node to add text to it. You can also add icons from a wide variety of them available, add hyperlink (to a link, file, or a text field), image, graphical link, etc. to a node. You also get option to insert rich format text along with tables in your mindmap. Now for more detailing, you are free to change node color, node background color, node edge color, node edge style, node edge width, and make a node blinking. Node style can be changed between bubble or fork. If you want, you can fold a node’s Children nodes to minimize it. If you want a replica of a node and its Children nodes, select and copy it to paste wherever you want on a mind map. You can either save your work with this mindmap software, or export as document or images. Save a mindmap as .mm file and export as HTML, Flash, OpenOffice Writer document, PNG, JPEG, PDF, SVG, etc. 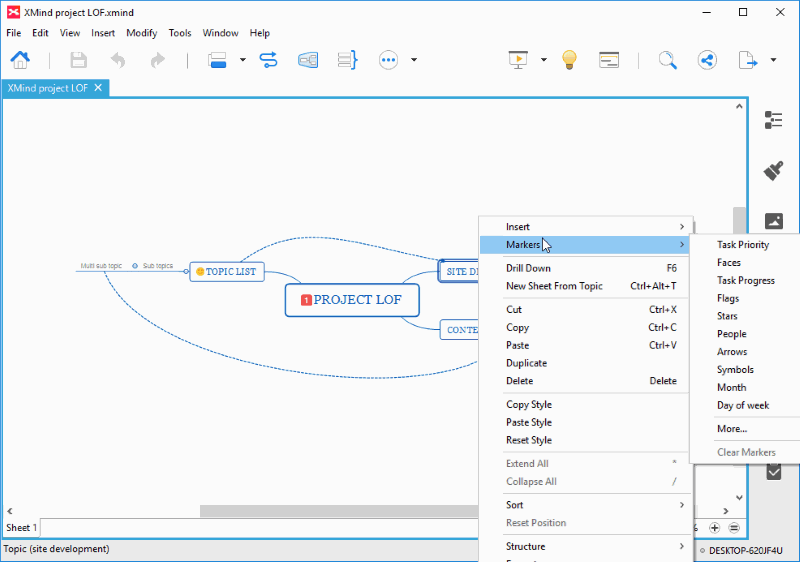 Print and print preview options are also available with this mindmap program, which let you print your mindmap without saving. 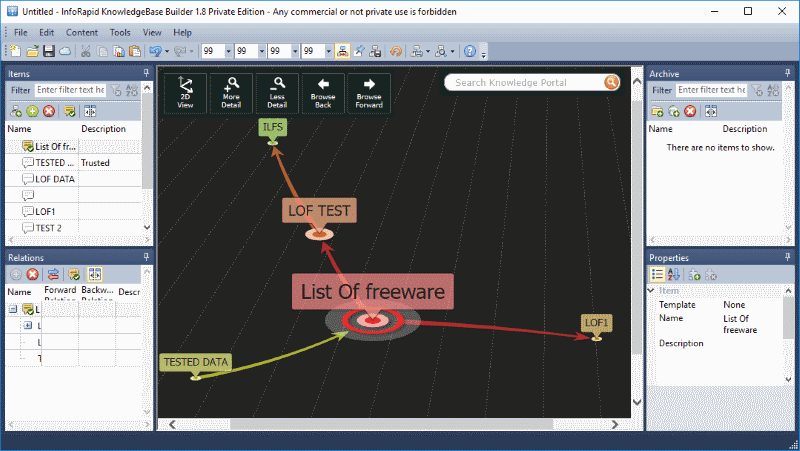 Freeplane is another Java based mind mapping software, which can be run on any Operating system (Windows, Mac, and Linux) with the required version of Java installed. Its an open source mindmap program and is absolutely free to use. It packs a bunch of features which you can use to make creative, informative, and simplified mindmaps. You are free to work on multiple ideas at a time in different tabs, and can create encrypted mind maps as well. When you begin with a mindmap, you an select to work with any of the 4 mindmap templates offered: Standard, BigMap, ConceptMap, or Essay. Start wring down your ideas or plans with a Parent node. Build your ideas by inserting Child nodes and Sibling nodes using the assigned shortcuts. You can add Child nodes to a Child node without any limit. To insert a Child node under a node, press Insert shortcut key, and to add a Sibling node to a Child node, press Enter shortcut key. Nodes can be modified easily by accessing a list of tools when you right click on a node. The options available let you Edit node core, Edit node details, Minimize node, Add image to node, Set a free positioned node, Add/Remove cloud around a node, Apply styles, Link nodes, Encrypt node, Copy node, etc. If a node has multiple Child nodes, you can easily contract/expand them when required. A node can be encrypted separately as well. Various navigation options have been provided along with shortcuts, which will help you to easily jump from a node to another using keyboard. Another good feature provided is the Filter, using which you can select, compose, highlight, etc. the filtered nodes. A Time Manager with Reminders is a bonus feature which you can make use of. Scripts can be added and executed here. Hot keys for certain functions can be defined manually, which gives you ease of use. If you want to save your mind map, then you can do so in .mm format. Export and Print map options are available. A map can be exported in the following formats: .adoc, .html, ..jpg, .xml, .tex, .markdown, .mwiki, .doc, .odt, .txt; .png, .tji, .pdf, and .svg. The free version of XMind, a fully loaded mind mapping tool, lets you create amazing and expressive mindmaps. You can begin writing down your ideas on a blank canvas, or you can select a mind mapping template to begin working with. You can also select the type of node map or chart according to your requirement, followed by theme selection. All these options let you customize your mindmap to make it look better. Talking about the features that count the most, Nodes and Links can be added pretty easily. Here nodes are referred to as Topics. Under a Parent topic, you can add Topics and Sub-topics. If you are on a sub topic, you can insert a Parent topic or Topic before. For all these operations, shortcuts are assigned. You can add a separate node apart from the main tree; its called as a Floating topic. To connect a Floating topic, use the Relationship option. For each node, you can add Labels, add Notes, add Hyperlinks, add Comments, and add Attachments. Text formatting option of this brain mapping software lets you change map structure, choose map style, change text attributes (font, size, color, etc. ), node shapes, node borders, and attributes of connecting lines. Another good option available here is that you can add icons as markers. These markers include icons to display numbers, task priority, task progress, flags, stars, arrows, symbols, months, days of week, and some emoticons. Simply drag a marker and drop at the desired node. A mind map can be saved as XMind Workbook and exported as JPEG and XML. Other export options are also available, but they are available in the Pro version. There are various other features that you can unlock by upgrading to Pro version. Some of the Pro features are: Mind map merge, Clipart, Audio notes, Gantt chart, export as PDF/DOC, Slideshow, etc. 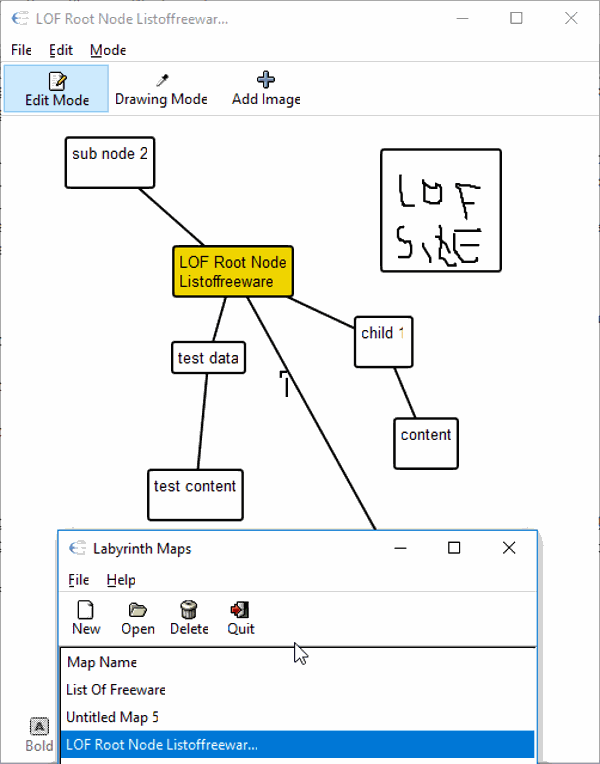 Labyrinth is a simple yet a fun to use mindmap software. It does not have a huge set of options and features; however, lets you create mindmaps pretty easily. The absence of high end formatting options turns out to be a positive point, as you do not have to focus on how your mindmap will look, and you can concentrate on your ideas to put them down. One can go with it if all you need is a mind mapping software without complex options and don’t want to make your mind map visually appealing. There are two ways provided to put down your ideas: enter text or freehand drawing. To begin, simply click on the blank canvas to enter text/draw for the parent node. Now to insert Child nodes, click on the canvas where you want to place it, then enter text or draw. Remember, if you want to make a Sibling node for the Child node, you will have to click and select the Parent node first. Not selecting the Parent node will create a new Child node for the Child node created for the Parent node. A node can be selected and pasted to a new location on the canvas. You can make the entered text Bold, Italic, or Underlined if you want. Double click on a node to edit the text. There’s an option to add Images, but when you browse and add an image, its not displayed. The created map can be exported as image in PNG format. Export the complete map, or only the visible area. MindOnTrack is developed as a task manager, which has an inbuilt mind mapping tool. Here you will find options to add Reminders, manage Projects, make Mindmap, etc. When you open this software, you will have to begin with a new blank map. Some options are available on the left panel of the interface. Scroll down to find MindMapping at the end of the list. The mindmap tool is pretty vast, just like Freemind. Begin creating a mindmap by adding a topic, and further add subtopics as required. You can also add a Floating Topic if required. Link two nodes, set boundary, or add a summary for a subtopic group. To make your map more appealing, you can add background color, change text formatting, node shape and color, and attributes of connecting lines. Various map structure templates are available to build a mindmap according to requirement. These structures are: Fishbone, Matrix, Tree, Logic chart, etc. Save your progress in XMind Workbook format, or export your mindmap as image, PDF, HTML, Text, etc. Blumind is an amazing brain mapping software, which will impress you with its simplicity to let you make mindmaps. You can work on multiple mindmaps side by side, customize topic nodes, add icons, add progress bars, and do much more. On a fresh mindmap canvas, a Center topic node is provided; double click to add text. Topics and subtopics can be added easily, either by keyboard shortcuts, through the context menu, or through icons on the interface. Copy a node and paste it anywhere on the canvas or on another mindmap. Options to change Node properties let you change Text formatting, Node color, Add icons, Add hyperlink, and Map layout. If you want your mindmap to look attractive, you can choose from a long list of themes available in various color schemes. An additional feature that this mindmap program has is a countdown timer. You can set a timer by defining hours, minutes, and seconds. To save your progress on the mindmap, simply use the Save option. Mindmaps can also be exported as PNG, JPEG, TIF, GIF, SVG, or TXT. 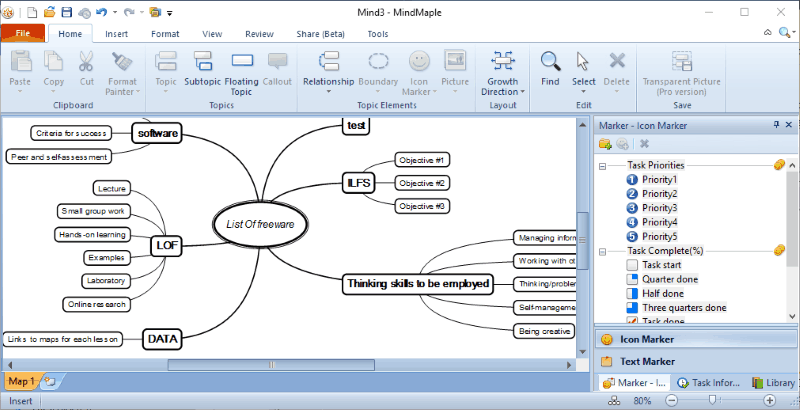 MindMaple Lite is the free to use version of MindMaple mind mapping software. Do not let the Lite tag fool you, because the free version is almost as feature rich as the Pro version. There are a bunch of tools that you can use to build excellent and customized mindmap. Multi tab support is available, which lets you work on multiple projects at once. While starting with a new project, you are asked to choose a Map Theme and a Map Template to build a mindmap. Based on the template you choose, a sample map is produced, which is fully editable. This gives you the ease to begin working on a mindmap, right on. Double click on a Node to change the text in it; along with text formatting. Each node and sub-node can be resized separately; this option is not available in any of the mindmap software reviewed till now in this list. You can make a set of sub-nodes to expand and collapse, in order to keep the mind map sorted. Other options let you insert Callout topic, Floating topic, Boundary, Relationship, Icon marker, Image, and Hyperlink. A set of Clip Arts is also available, which can be inserted into topic nodes. The Map formatting tools let you keep your mindmap sorted. With these tools, you can define node growth direction, add numbering, align topics, balance map, increase/decrease sibling topic spacing, change child topic spacing, etc. The Task Manager tool is a very useful tool, through which you can set tasks for a node. Add task priority, start date, due date, duration, etc. Save your data in .emm format. Mind maps can be exported as Image, Word document, Excel document, Powerpoint document, HTML, or Text. Option to export as PDF is available in the Pro version. InfoRapid KnowledgeBase Builder is one of a kind mind mapping software, which follows a creative, but easy approach to make mindmaps. 3D view of mindmap makes this software more interesting to work with. Create an Item as a node, then enter topic description if need be. Press Insert to add a sub-node to the Parent node. Sub nodes to the Child nodes can be added as well. The node and text color is customizable, and can be changed easily from the Properties window. New relationship arrows can be added and their directions can be changed as well. Other advanced features are not available; however, the creative way of creating mindmaps easily in 3D is the catch. You can easily save your progress and work on it later. You can also upload your work to cloud on this software’s server, but the uploaded item stays available only for 7 days. You can always export a created map as Image or CSV file. The free version is only available for personal use; you cannot use it for commercial purposes. 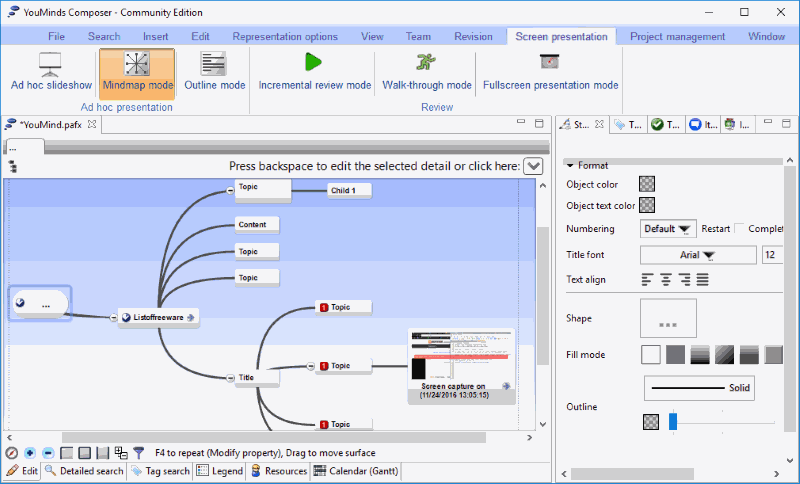 Mind Architect is another standard mindmap software. It has both free and paid versions; the free version lets you create small and mid sized mindmaps, while with the paid version, you can create large mindmaps. Both the versions share the same tools and features. You can begin working on a mindmap by selecting from one of the 9 mindmap templates. Add text to the parent node, then resize the node if required. When you click on a node, a + sign appears, click on + to add a subtopic. You can add Child nodes to a Sub-topic in the same way. While you create multiple Child nodes of a Sub-topic, you also get an option to contract or expand them. Text formatting, text color, node color, and branch color can be changed easily. You can also change the map style anytime you want. The context menu provides various important options, such as Copy, Paste, Insert Image, Insert Line, Insert Table, and Show Grid. Save your progress as Mind Architect Document, or Export the map as Image or PDF. You can also print the map, right from the interface of this mindmap software. Docear is developed as an Academic Literature Suite, where you can create vast mindmaps. This open source mind mapping software is free to use and is cross-platform, available for Windows, Mac, and Linux. The tools and options available to build mindmaps are extensive; lets take a look. The interface displays options to add Parent node, Child node, Sibling node, Summary node, or Free node. You can easily move a node up/down/right/left, split node, merge nodes, and do much more. The option to connect two nodes lets you change connection direction, opacity, connector shape, width, etc. Links can be added to nodes; these links can be hyperlinks or links to files stored locally on your PC or network. Encryption is provided for security. You can either create an encrypted mindmap, or simply encrypt a branch. Let me mention some more features of this freeware, that are worth mentioning: LaTex Support, Text formatting, Node formatting, Advanced filter, Time manager, Script support, Icons, and much more. Save your mindmap in standard .mm format, or export as HTML, HTM, XML, and JPEG. hUMLa is a free and crossplatform mind mapping software, which is primarily a UML-class diagram maker. It is developed in Java, so it can run on Windows, Mac, or Linux. 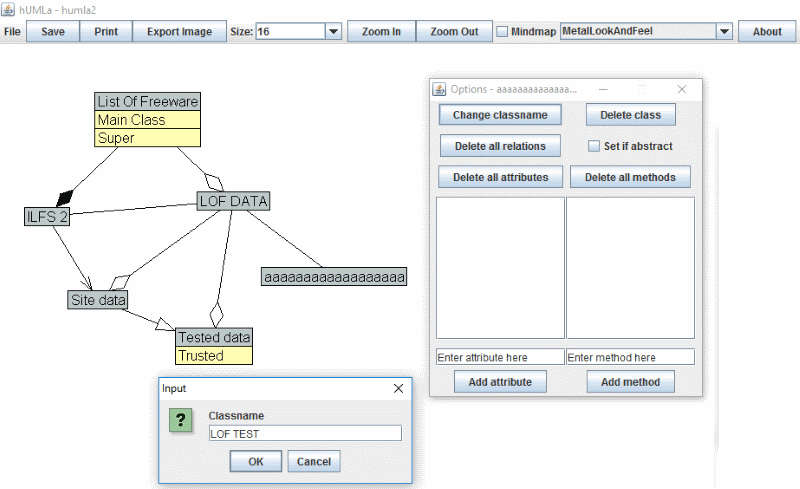 By default, it creates a UML-class diagram, and when you select the Mindmap option, the diagram is converted into mindmap. Basically, UML-class diagram has rectangular nodes, and mindmaps has oval nodes. Also, you can define connection directions in UML-class diagram, but directions disappear in mindmaps. To create a node, simply click on the canvas and type the content in the dialog box that appears. Click on the canvas to make another node. To connect two nodes, simply drag he mouse pointer from one node till another node. 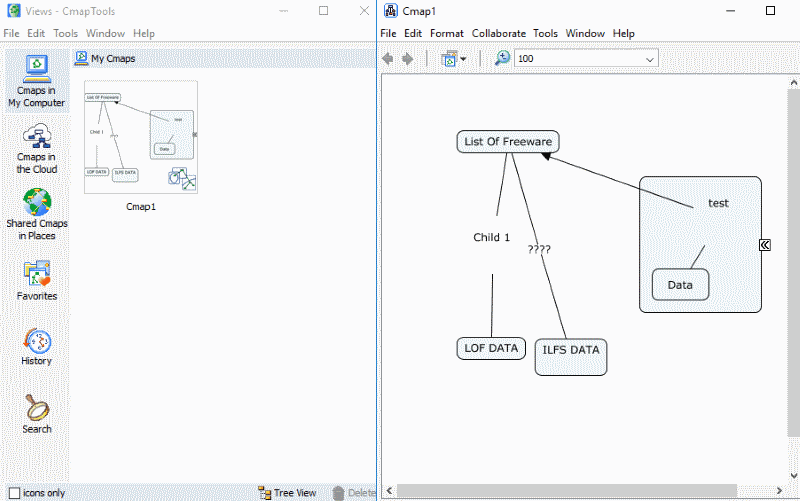 As soon as you release the drag, a dialog box appears, where you can define the connection type (only works with UML-class diagram). You can save your project to use later, or export the mindmap as an Image in PNG format. Cmap is a free mindmap software, with options to fully customize nodes and make simple as well as complex mind maps. Create a node, and begin creating Child and Sibling nodes to put down ideas systematically. When you click on an existing node, you will see an arrow pop up; drag it to place a new node. There is a floating window available, where you can change Font attributes, Node style and color, Connecting line attributes, and the background color. I found it very easy to make mindmap with this software, as compared to most of the listed mind mapping software. A mind map can be exported in PNG, PDF, PS, SVG, HTML, CXL, etc. YouMinds Composer lets you make detailed mindmaps for free. Although the free version does not have all the features the Pro version has, it can create mindmaps easily. Along with mindmaps, you can make Timeline, Organizational chart, and Note sheet book with this free mind map program. Adding a Parent node, Child node, and Sibling nodes is easy, and can be done by pressing respective shortcuts. Nodes can be customized here, and you can change node color, shape, opacity texture, size, and much more. Text formatting lets you choose text font, color, and size. Visual tags can be added to nodes in form of smileys as well as clipart. You can also add Hyperlink to nodes here. A task manager is available to add tasks for specific date along with task priority. An advanced filter is available, which can be used to look for desired text or node across a vast map. Export options are available for a vast range of formats: png, jpg, bmp, svg, html, pdf, and txt. This mind mapping software has a very interesting feature to start a team session to collaborate and make a mindmap. There’s also a chat box to chat with the team participating in a session. The Brain is a bit complex mindmap maker, which may take some time to get used to. The free version has some restrictions; however, it is capable of making amazing mind maps. Begin by creating a Parent Node. Create Child nodes, and sibling nodes with the help of respective shortcuts or from the context menu. The free version lets you link a file or web link to a node. You can also set various themes for a mindmap. The nodes branches contract and expand depending on the selected node. The map does not remains static, and that becomes a problem sometimes to get an overview of the map at once. You can save a mindmap, but cannot export it, as it is a pro feature.